This is a great movie! Sure the kids will have fun, but parents will love it too. Even miscellaneous kid-less adults will like it because it's simply a great movie. It's got action, depth, fun, comedy, profound messages and it's gorgeous to look at. Even if the dialogue had been thin or boring (which it wasn't), I would have still marveled at the lush watercolor-esque scene layouts, stylized characters and endearing animation. There is virtually nothing wrong with this film! In my humble opinion it's way better than Indy 4 or Narnia: Prince Caspian. I did say "virtually" perfect. Unfortunately, the one place at which I saw room for improvement might require spoilage on my part to explain, and I dare not spoil such a beautiful film � so I'll shut my mouth about it. Anyway, if you haven't noticed already, I'm very excited about this film. It kept me completely engaged and smiling. I left the theatre feeling great and any further thought about KF Panda � warms my heart. You can't ask much more of a film than that. The film translated very nicely to the IMAX screen; while it's probably just as beautiful on standard screens, I'll certainly recommend you see it on the big screen to bring you that much more into the picture. Oh heck, this is my favorite film of the year so far -- A+! 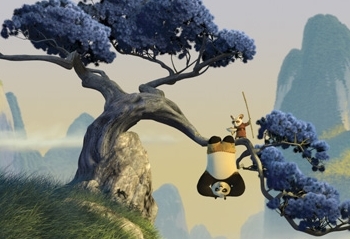 Zen Shorts - A Panda kid's book by one of my fav Illustrators. Read the first chapters of my books. 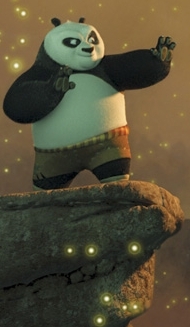 Kung Fu Panda. Copyright © 2008. Copyright © 1998-2019 Ross Anthony, Author - Speaker - Solo World Circumnavigator In addition to reviewing films and interviewing celebs at HollywoodReportCard.com, traveling the world, composing great music, motivational speaking, Mr. Anthony also runs his own publishing company in the Los Angeles area. While traversing the circumference of the planet writing books and shooting documentaries, Mr. Anthony has taught, presented for, worked &/or played with locals in over 30 countries & 100 cities (Nairobi to Nagasaki). He's bungee-jumped from a bridge near Victoria Falls, wrestled with lions in Zimbabwe, crashed a Vespa off a high mountain road in Taiwan, and ridden a dirt bike across the States (Washington State to Washington DC). To get signed books ("Rodney Appleseed" to "Jinshirou") or schedule Ross to speak check out: www.RossAnthony.com or call 1-800-767-7186. Go into the world and inspire the people you meet with your love, kindness, and whatever it is you're really good at. Check out books by Ross Anthony. Rand() functions, Pho chicken soup, rollerblading, and frozen yogurt (w/ blueberries) also rock! (Btw, rand is short for random. It can also stand for "Really Awkward Nutty Dinosaurs" -- which is quite rand, isn't it?) Being alive is the miracle. Special thanks to Ken Kocanda, HAL, Jodie Keszek, Don Haderlein, Mom and Pops, my family, R. Foss, and many others by Ross Anthony. Galati-FE also deserves a shout out. And thanks to all of you for your interest and optimism. Enjoy great films, read stirring novels, grow.